When you’re buying a new car, you might think that a higher price guarantees reliability – but nothing could be further from the truth. According to the last Which? car survey, one of the most fault-prone car classes is also the most expensive: luxury cars. 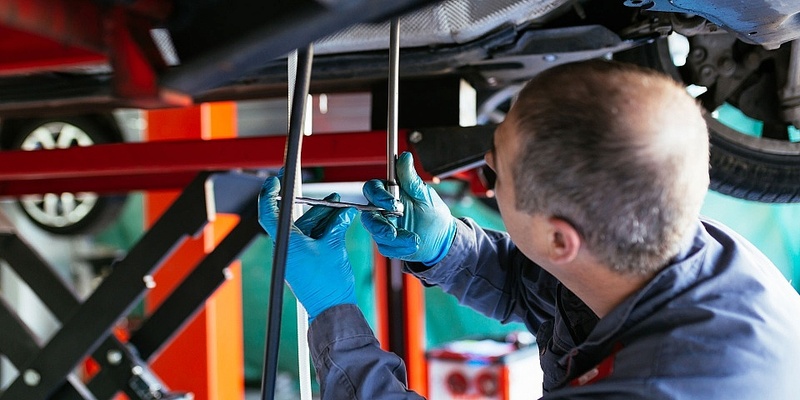 Despite owners spending an average of £53,150 for their new fancy set of wheels, nearly a third of luxury car owners with a vehicle aged less than three years old reported a fault in our last car survey. That’s the highest average fault rate among all the car classes. By comparison, city car owners spent nearly five times less on their new vehicles, and enjoy the lowest average fault rate. It’s not just luxury cars in the dock. Expensive large SUVs tie with luxury cars on reliability, thanks to high fault rates and longer-than-average stays in a garage. Large SUV owners pay, on average, the second highest amount for new cars: £41,296. The Which? 2019 Car survey is now open, and whether your car is reliable or not, we want to hear about it. Your feedback will help us rate cars, and you could win £2,500 for taking part (T&Cs apply). 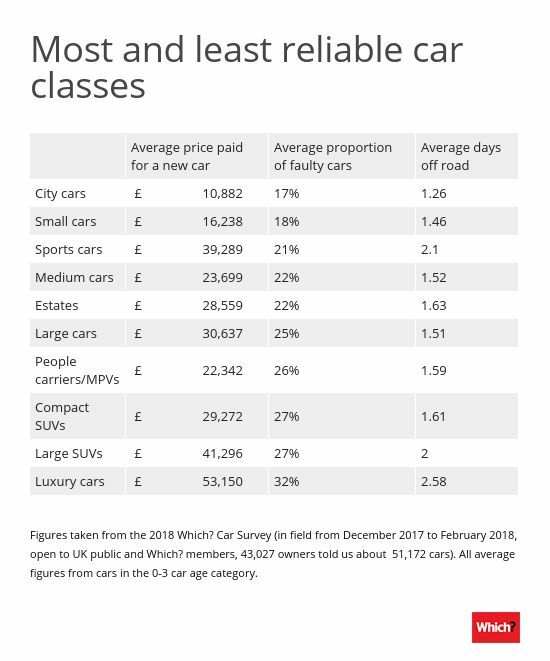 This table shows how all classes of car compare for price, faults and average days off road (being fixed). As you can see from our table, above, nearly twice as many luxury cars developed a fault, compared to city cars. Both large SUVs and luxury car owners also had to put up with their car being off the road for longer than their smaller car counterparts. The average price paid for a new car in the last survey was £27,034. But those wanting a large SUV or luxury car paid well above this benchmark for their new vehicle. Want to know which specific cars are the most and least reliable? We reveal the most reliable cars. What goes wrong with luxury cars and SUVs? It would be easy to assume that because luxury cars have so much more equipment as standard, there is more to go wrong compared with your average city car. The most common complaints among large SUV owners followed a similar theme, but also included tyre-pressure sensors. According to our survey, city-car owners spent an average of £10,882 on their new vehicles, just shy of five times less than what luxury-car owners paid. According to our figures, it’s the cheapest class of cars by a margin of over £5,000. And it looks like money well spent. Just 17% of city car drivers with a car aged less than three years had a fault to complain about. That’s the lowest average fault rate among the car classes, and nearly half that of luxury car owners. Of the unlucky few that did experience something going wrong, the car was in the garage for an average of less than a day and a half, which is the lowest off-the-road figure of any car class. Small cars are a bit bigger than city cars and, on average, owners spent £16,238 on their new small car. The Ford Fiesta, pictured above, is the UK’s best-selling car, according to the SMMT (Society of Motoring Manufacturers and Traders), and a proud member of the small car class. Does its popularity come from its reliability? 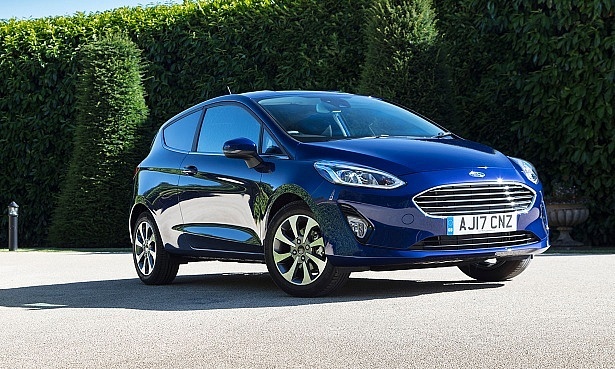 Find out how it’s treating its owners, and what we made of the latest Fiesta in our tests, by heading for our independent, expert new and used car reviews.